One thing that made the evening so special was that my children were there to see me accept the award. I believe it is one of our greatest responsibilities to inspire and educate the next generation, which is why the mission of Junior Achievement is so close to my heart. If you are not familiar with the organization, Junior Achievement is a global organization that provides real-world financial literacy, entrepreneurship and work-readiness education for youth from kindergarten through 12th grade. The programs are designed to supplement the education they receive at school by providing life skills such as how to manage money, succeed in the workplace or start a business that creates jobs. Last year Junior Achievement of Southwest New England utilized more than 2,500 volunteers — business professionals, parents, retirees, and college students — to provide programs to more than 35,000 students in our area. Their contributions are so important because today, more than ever, our young people need positive role models who can help them build self-confidence, develop their skills and encourage them to pursue their dreams. While honors such as this are humbling and I hope they serve to inspire others to follow their dreams, they also remind me of the valuable work being carried out by organizations such as Junior Achievement and those who support them. That’s why I am so excited to see the Edible Arrangements corporate team, partners and suppliers step up with their overwhelming support of Junior Achievement. Under the direction of Tom Horn, our Vice President of Human Resources, Edible Arrangements mobilized an impressive fundraising campaign for Junior Achievement that will have a significant impact on the organization’s work throughout Connecticut. I want to thank Junior Achievement for the honor they presented me last night, but I share this honor with many. I would not be where I am today without the support of so many people, and it was a true gift to have many of them join me at last night’s event. First of all, my Mother and Father offered me tremendous guidance and support as I was starting the business, and I am blessed to have my wife Asma continue that tradition now. 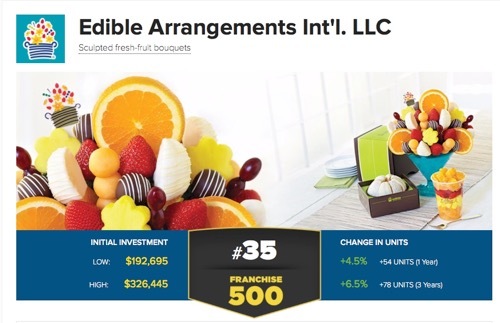 Thank you to our franchise owners and fruit experts for their confidence and trust. Nine of them were able to come last night, including Chris Dellamarggio who was the first person to tell me I should franchise the business, and who trusted me enough to join me on the journey. Thank you to my amazing team members at Edible Arrangements, Netsolace, Naranga and BroadPeak for everything you do every day to help me follow my dreams. I could not do any of this without you. To our business partners all over the world, thank you for helping us to “celebrate what’s good in life”. And most importantly, to our sweet customers—a heartfelt, chocolate dipped Thank You for your love of Edible Arrangements! If you would like to find out more about Junior Achievement and how you can support their work, I encourage you to visit the organization’s website at http://jaconn.org.